Dumplings are steamed food generally popular in South East Asia. It is more like the momo but the outer cover is made with rice flour for dumplings. Dumplings can steamed snack and generally we Indians make it as modak or kozhukattai during ganesha chaturthi festival. I wanted to try some savory dumplings and to make it kids friendly and made that with paneer and potato. I got this idea of shaping from a youtube video and you can make it as a modak too. The orange sauce i learnt from Masterchef Nikita gandhi 's cookery workshop which i attended in November 2016. She is a super talented young girl and all the recipes she taught were interesting and tasted yum. She made this citrus sauce to pair with momos. 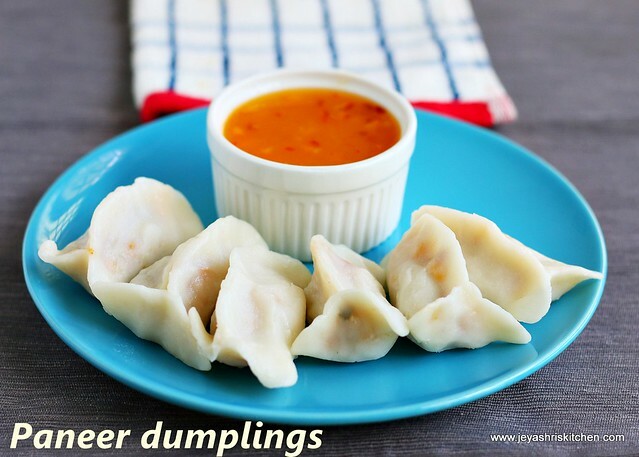 Try this easy and healthy dumplings at home and let me know how your kids liked it. I wanted to make a full video recipe but it had some lighting issues as i shifted to a new location to shoot the video. So ended up posting the shaping part only. Scroll down to see the video on how to shape the dumplings. Make the outer cover for the dough and cover it with a damp cloth and keep aside. Check out my post on how to make outer dough in 4 ways. For the filling, chop the onions finely. Boil the potato and peel the skin. I used frozen corn. You can use green peas too. In a pan add oil and add the finely chopped onions. Once they becomes translucent add the grated paneer and sweet corn. Mash the potatoes and add that too. Add red chili powder, salt and garam masala. Mix well and cook for 2-3 minutes. Filling is ready. Allow this to cool completely. Lets make the orange sauce. Bring the orange juice, red chili flakes, sugar, salt and orange zest into a pan. Mix well and let this cook for 2 minutes. Dissolve the corn flour in water. Add this to the pan and mix continuously. This will start thickening and become a glaze sauce. Switch off the flame. Sauce is ready. Make the dough into lemon sized balls. Grease your hands with sesame oil and start stretching the dough. Place 1 tsp of filling into that. close it half way as how we do it for the ulundu kozhakattai. 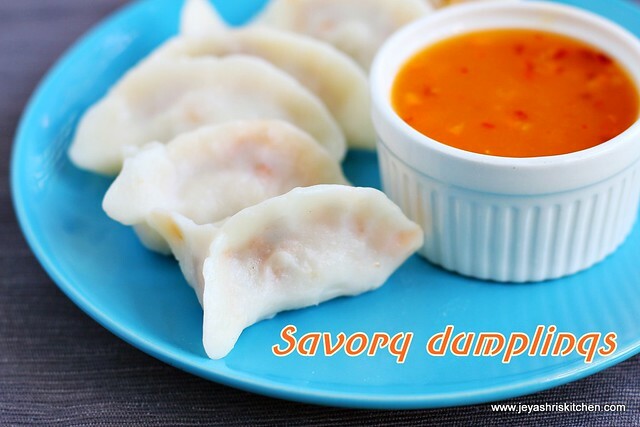 The video will give you an idea on how to shape the dumplings. Do not close till the end. You can shape like a modak too if you want. Bring the end of the outer layer to the center to make a triangle shape. Grease a idli pan, steam the dumplings for 7-8 minutes. Once done, switch off the flame and leave it for a minute. Take out and serve with orange sauce. You can make any filling of your choice. The sauce you can use as a dip for any starter. Keep the dumplings covered all the time to avoid getting dried. You can add some tomato or spinach puree to the water while making the outer cover to make it colourful and healthy. You can replace paneer with cheese too. Unique recipe.Will try.We get pau flour @Fairprice in the baking section.Do try dumplings with it. oh this is new to me. Will try it out.